A guitar concert with Johan Sebastian Bach as the protagonist, with the interpretation of the Suite 2 for lute in c minor (BWV 997) and the Chaconne in d minor (BWV 1004). The transcriptions for guitar and interpretation are executed with admiration, understanding and loyalty to the essence of Bach. The concert is ideal for all the people who enjoy classical music and the guitar, the show is intended for audiences of all ages. The baroque is the most complete time for music, and especially Johan Sebastian Bach, that combines technique, sensitivity and beauty. It is an arduous task that must be carried out and over the years it is when the understanding and the interpretive pleasure of his works begin. One of the principal aims for the adaptation of the Suite was to project with maximum clarity the different fibers that form its complex contrapuntal texture. With that in mind, we chose the tonality of C minor (instead of the more typical of A minor) by means of a capo on the third fret; this way, a better projection of the higher harmonics is obtained, something that further enhances the threads of the texture. To counterbalance the slight loss of the low end of the instrument, some of the bass lines were carefully transposed. 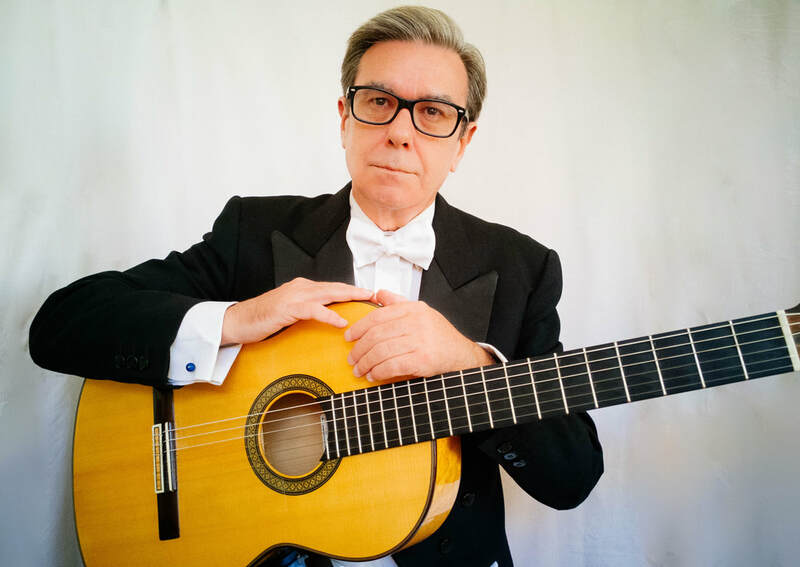 The Chaconne is well settled in the guitar repertoire since it was arranged by Andrés Segovia in the year 1935. Thanks to the enhanced polyphonic capabilities of the guitar when compared to those of the violin, some sections of the work adapt perfectly (we would not dare to say "easily") to it. What remains immutable is the extreme complexity that implies such an economic work in its means (a soloist; four chords) but so huge in its technical and emotional demands. During his years in Leipzig, Bach composed two of the most emblematic pieces of the lute repertoire: the Suite 2 in C minor BWV 997 and the Prelude, Fugue and Allegro BWV 998. The affinities between these two pieces do not end there: both open with a pair prelude and fugue, in both cases the fugue being a fuga da capo. But while the BWV 998 is rounded with a movement marked by an Allegro indication, the work that occupies us ends with a Sarabanda and a Giga with its Double. This is probably why it was labeled as a Suite, whereas the BWV 998 ended with the more abstract Prelude, Fugue and Allegro. Structurally, the prelude of the BWV 997 is an elaborated example of what Lester denominates a parallel-section construction; that is, a succession of harmonic periods similar in structure and motivic material but increasingly intensified. The subsequent fuga da capo has a tripartite structure in which the initial exposition is repeated literally at the end of the piece, framing a developmental central section in the same manner as the aria da capo. This central section has an ingenious inner working, since complete blocks of it are reused again and again by changing the tonalities and the disposition of the voices. This way, a very elaborated result from very restricted means is obtained. The Sarabanda and the Giga follow the binary form typical of these pieces. Among the interpretive decisions, we thought necessary to emphasize by ornamentation the repetition of each of the two sections of the Sarabanda, whereas for the Giga we decided to make a consistent use of the inegalité, something which gives it a "French" character and heightens the contrast with the following Double. One of the principal aims for the adaptation of this work was to project with maximum clarity the different fibers that form its complex contrapuntal texture. With that in mind, we chose the tonality of C minor (instead of the more typical of A minor) by means of a capo on the third fret; this way, a better projection of the higher harmonics is obtained, something that further enhances the threads of the texture. To counterbalance the slight loss of the low end of the instrument, some of the bass lines were carefully transposed. On one stave, for a small instrument, the man writes to whole world of the deepest thoughts and most powerful feelings. If I imagined that I could have created, even conceived the piece, I am quite certain that the excess of excitement and earth-shattering experience would have driven me out of my mind. This work is well settled in the guitar repertoire since it was arranged by Andrés Segovia in the year 1935. Thanks to the enhanced polyphonic capabilities of the guitar when compared to those of the violin, some sections of the work adapt perfectly (we would not dare to say "easily") to it. What remains immutable is the extreme complexity that implies such an economic work in its means (a soloist; four chords) but so huge in its technical and emotional demands. La Folía (or Folia d'Espagne (France), Follies of Spain (England) or Follia (Italy)) is one of the oldest known European instrumental pieces. Originally a free improvisatory formula in the minor mode, it finally coalesced in a harmonic period of 16 bars with a fixed sequence of chords with a Sarabande character. This structure was used to frame a series of variations in which the voice leading and the harmony were retained, while its figuration was varied at will. La Folía enjoyed great popularity during the Baroque era, and it was favored by many composers like Corelli, Vivaldi, Lully or even Bach. Les couplets de Folies of Marin Marais are part of the Suite in D minor of his second book of pieces for viol, published in 1701. Initially conceived for a solo viol with a thorough bass, Marais indicates that the viol part can be taken by other instruments such as the organ, the theorbo, the lute, the violin or the flute. The piece comprises 32 variations to the Folía. The rendition here presented is a selection of 15 of these 32 variations arranged for solo guitar, and offers the personal vision of the player of this "organized freedom" that conforms the philosophy of the piece. The chosen tonality (E minor) and the guitar tuning (with the fifth string to B) allow the projection of the low end as well as the soloist lines without loosing its brightness or depth. This recording strives to present the listener a superior soundscape, with an eye on both the spatial relation with the player and the harmonic richness of the guitar. The selected instrument –an example of the craft of the luthier Ángel Benito Aguado– projects the higher harmonics neatly, thanks mainly to its construction system (similar to the French) and to its wood (top of German pine and palo santo body). A pair of stereophonic microphones AKG 414 were employed, a very efficient setup for the recording of plucked string instruments. They were placed at the exact distance in order to avoid an excessively proximate image. The result is such that, if listened to through a good sound system, the quality of the reverberation, the harmonic richness and the sonorous image –with enough air between the listener and the player– resembles that of a medium-sized chapel. Litzman, Berthold (editor). "Letters of Clara Schumann and Johannes Brahms, 1853–1896". Hyperion Press, 1979, p. 16.